This session has openings. Registration for this session will end on 6/10/2019 at 5:00 PM. During this camp session, you will experience the most exciting adventure-based activities that are offered at Camp Lookout. Campers will learn new skills while having the time of their lives! Campers are eligible for grade level activities based on their grade entering the fall of 2019, plus all earlier grade level activities. Please note that there are more activities than can possibly be completed in a session of camp. Time, availability, and weather are all factors affecting the actual camp activity experience. 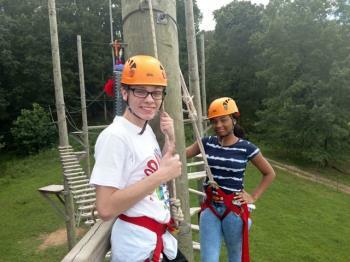 Outdoor High Adventure (Grades 10-12) begins Monday 9:00 – 10:00 a.m. and ends Friday with a 2:00 p.m. closing. More details can be found in the 2019 Camp Lookout brochure and on our website www.camplookout.com.